For the community in Houston County, see Henderson, Houston County, Georgia. 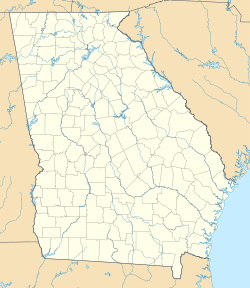 Henderson is a census-designated place (CDP) in Chatham County, Georgia, United States. The population was 1,647 at the 2010 census. It is part of the Savannah Metropolitan Statistical Area. Henderson is located in western Chatham County at 32°0′15″N 81°16′4″W﻿ / ﻿32.00417°N 81.26778°W﻿ / 32.00417; -81.26778. It occupies a triangular area bounded by Little Neck Road to the northeast, Georgia State Route 204 (the Abercorn Expressway) to the south, and Interstate 95 to the northwest. Downtown Savannah is 15 miles (24 km) to the northeast. Henderson Golf Course occupies the southern part of the CDP, with housing developments set around and between the links. Commercial development occupies the southwest corner of the CDP, adjacent to I-95's Exit 94. According to the United States Census Bureau, the Henderson CDP has a total area of 1.8 square miles (4.7 km2), of which 1.7 square miles (4.5 km2) is land and 0.12 square miles (0.3 km2), or 5.29%, is water. ^ a b "Geographic Identifiers: 2010 Demographic Profile Data (G001): Henderson CDP, Georgia". U.S. Census Bureau, American Factfinder. Retrieved July 22, 2014. This page was last edited on 4 January 2019, at 02:56 (UTC).